This is the perfect, quick, easy, and cute, project for those last minute holiday gifts. So grab some fat quarters, or, better yet, use up those scraps! :-) In fact, you can make this entire wallet with just one fat-quarter! (I, however, would suggest using 4 Fat Quarters, mixing and matching the parts (you can cut them all at once if you layer the fat-quarters), and make 4 different wallets!) 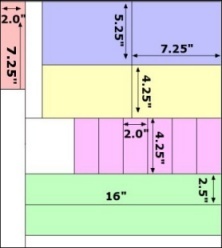 FQ Layout. Novelty Fabric 1 2 @ 5.25" x 7.25" Outer wallet and inside lining. Novelty Fabric 2 2 @ 4.25" x 7.25" Currency Pocket lining and outer. Novelty Fabric 3 6 @ 2" x 4.25" Credit card pockets (front & back) *Consider using scraps for more flair. Novelty Fabric 4 1 @ 2.5" x 28"
Thermolam Batting (or craft fleece) 1 @ 5.25" x 7.25"
Layer 1 of the Novelty 1 fabrics, right side down, then the 5.25" x 7.25" batting, and the other Novelty 1 fabric, right side up. Layer 1 of the Novelty 2 fabrics, right side down, then the 5.25" x 7.25" batting, and the other Novelty 2 fabric, right side up. Pin in a few places to keep it together, and then machine quilt it using a grid spaced about 2" apart. Lay 2 of the Novelty 3 fabrics, right sides together, then lay the interfacing on top. Stitch along one of the long sides, using a 1/4" seam allowance. Fold the fabric out, so that the novelty fabric is facing outwards. Press the seam flat. 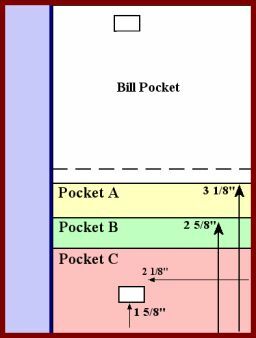 Repeat the steps above for the remaining two pockets. If you like, quilt a couple of decorative lines across each pocket. Consider using a metallic thread for some pizazz. 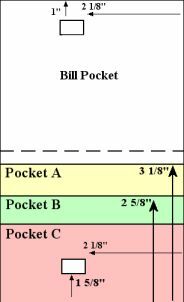 Following Diagram #1, layer Pocket A on the bottom half of the currency pocket, and stitch it down using a 1/4" seam allowance along the bottom of Pocket A.
Repeat the above to attach Pocket B and Pocket C.
Fold the 2" x 7.25" strip of Novelty 4 in half lengthwise, wrong side together, and press with an iron. Align the raw edges of the folded strip with the raw edges of the currency pocket/credit card pocket section and attach it using a 1/4" seam allowance. Fold the binding over to the back, and either hand stitch it down, or pin it down, and stitch-in-the-ditch along the front of the pocket in the binding seam. 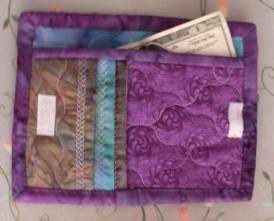 Lay the currency pocket section, right side up, on top of the wallet section, aligning the right, raw edges together. Use some pins to hold the two units together. Fold the 2.5" x 28" strip of Novelty 4 in half lengthwise, wrong side together, and press with an iron. Attach the binding to the front of the wallet, starting at the bottom middle. Fold the binding to the inside and stitch down. The binding stitching is what will hold the two parts together. All graphics and content ©2001, 2002 QuiltPox.com & Kimberly Crapsey, unless otherwise noted. All rights reserved. That means, that any of the web graphics I created, or any of the text that I have typed, should not be used without my express written/verbal permission. You may not quote this web site in part or its entirety without first asking me. You may use any of the patterns herein for personal and/or commercial usage. Commercial usage is limited to 10 quilts/year. A referral to my web site is appreciated. Please email me before using patterns for educational purposes.